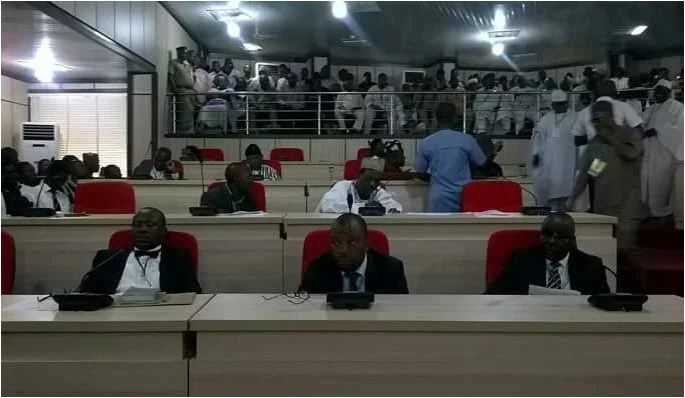 INEC on Tuesday in Makurdi presented a certificate of return to Joseph Boko in compliance with the Appeal Court judgment that sacked a Benue lawmaker, Benjamin Nungwa. Mr Nungwa, a member of the All Progressives Congress (APC), currently represents Kwande West. The new legislator, whose three years of legal battle traversed courts of different judicial jurisdictions, was finally served justice at the Appeal Court, on the orders of the apex court. Mr Nungwa had, in 2015, challenged the outcome of the APC primaries that produced Boko. His appeal was successful and the National Working Committee (NWC), of the party upturned the results in his favour. Aggrieved by that decision, Mr Boko approached the Federal High Court where he argued that the NWC denied him of the right of fair hearing since he was never invited to their meetings. He also argued that he was validly elected by the party to contest the 2015 general elections and that his name was illegally substituted with that of Mr Nungwa, urging the court to order Mr Nungwa to relinquish the legislative seat to him. But Justice Binta Nyako, while ruling on the matter, affirmed Mr Nungwa as the authentic APC candidate and winner of the election, hinging her judgment on the decision of the NWC of the party. Efforts by the appellant to reclaim the disputed legislative seat failed again at the Appeal Court after it declined jurisdiction on the matter. He eventually approached the Supreme Court, which after listening to his arguments, transmitted the case back to the appeal court with directives for accelerated trial that was based on merit. Delivering judgment on the matter at the appeal court on Monday, Justice Joseph Ekanem, supported by the president of the court, Justice Hannatu Sankey, overturned the judgment of the Federal High Court, which affirmed Mr Nungwa as the winner of the legislative election. The court declared that Mr Nunwa was an ” illegal occupant of the seat”, and ordered him to immediately vacate it and return all salaries, allowances and other benefits he received during the period. It directed that the monies be returned to Mr Boko, the right owner of the seat. Presenting the certificate to Mr Boko, the INEC Resident Commissioner, Nentawe Tilwatda, said the decision to hand over a new certificate to Boko was to comply with the judgment of the court. He said the exercise was to pave way for Mr Boko to join his colleagues in the legislature as the authentic representative of the people. Receiving the certificate, Mr Boko said he was overwhelmed with joy, and dedicated the victory to God and democracy. “I was propelled to seek justice by the love of democracy and the pursuit of truth for the purpose of strengthening democratic values for a better tomorrow. “Today is particularly good for the people of Kwande West because they have all stood by me in this fight against the forces of darkness,” he said.